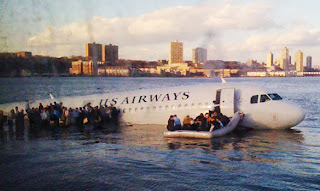 An aeroplane landed in the Hudson river this morning. Or more accurately crashed, seeing as a large flock of birds passing through the engines meant that it didn't have much choice in the matter. Lots of news outlets are reporting that a twitter photo has been beamed around the world, appearing in newspapers and online and giving the taker his 15 minutes of fame. What I'm wondering is, how much has he been paid? Newspapers traditionally pay photographers for content and the picture was viewed over 7,000 times before twitter's servers crashed. In the UK, the Press Complaints Commission is investigating the publication by newspapers of pictures and other material obtained through social networking sites. Newscorp bought the owner of Myspace.com for $580m with Rupert Muroch saying that the site would drive traffic to Newscorp's Fox TV sites. What it definitely did is gave Fox TV access to the next David Beckham's drunken teenage party pictures. How much is that worth?